The flesh of the rainbow trout is white, pink or orange in the raw state and lightens when cooked. It is a mild flavored fish with delicate small flakes and a nut-like flavor. Most Wisconsin rainbow trout sold in grocery stores are raised in outdoor ponds and raceways fed by cold spring water. 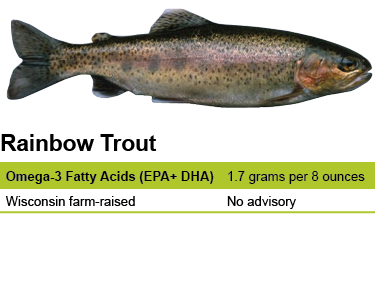 There is no consumption advisory for Wisconsin farm-raised rainbow trout. Rainbow trout are a member of the salmon family. They are native only to the rivers and lakes of North America, west of the Rocky Mountains, but their popularity led them to be introduced to waters all over the world. They were the first fish to be farm-raised in North America, dating back to the 1800s. They reach market size in 8-12 months.